Welcome to Casa Chulada, a luxury home recently completed in the quiet village of Troncones, Mexico. As some of you know, chulada is a word sometimes used to describe people, places and things which means “exceptionally or exceeding beautiful” -- often luxuriously and deliciously so. We chose the name as it describes the feeling we have when we are here – in the house, the gardens, the pool, on the beach and in the surrounding communities – and the feeling that we hope you will experience. Chulada offers beachfront living with the ambiance of a beautifully furnished and decorated real home -- a place for comfortable living with healing energy. Our home away from home can be your base to relax, play and enjoy yourself from which you can venture out as you wish -- locally or for example to Morelia, Patzcuaro, San Jose de Cobre . . . .
Troncones offers the quiet beauty of a beach village with soft sand, surf, great places to eat and lots of activities including swimming, walking, hiking, biking, fishing, horseback riding and kayaking. We have yoga, qigong and massage nearby (or in house if you prefer). We have great little shops for gorgeous gifts. In the nearby town of Majahua you can relax under a ramada and eat seafood, drink beer and sleep in hammocks. Or in Buena Vista, also close by, you can eat delicious tacos or traditional pozole. Further away (though only 20 minutes by car), in the towns of Zihuatanejo or Ixtapa, you can shop, bank, eat, hire a fishing boat or enjoy the nightlife. Casa Chulada is located on the newly paved beach road between the hills to the east and the ocean on the west. The house has 3 bedrooms – a master with king bed, two other generously sized rooms each with queen beds and their own bath (the blue bedroom bath is also available for use from the living and dining rooms). A highlight of the home is the beautiful large and fully equipped chefs’ kitchen with a Viking 6 burner/gas range with grill and huge island and breakfast bar. There’s a 2 bedroom apartment above the garage -- one bedroom with queen bed and one with 2 twins (can be made king size if needed). There’s a kitchen, bath and dining - living room (which can be converted for sleeping if needed). There are 2 outdoor living spaces between the house and the beach including a dining area and kitchen with a BBQ grill and a pizza oven. On the other side there’s a shade structure that can be used for lounging, dancing, yoga or . . . .
Chulada's marvelous pool (40’ x 18’) which has a stepped entry and a uniform depth of about 5’, is on the beach side of the property between the kitchen and the shade structure. We keep the pool relatively chlorine free -- cleaning frequently and treating the water with a copper and silver ion system that allows us to use the least amount of chlorine possible for cleanliness and safety. There’s an outdoor shower and pool bath nearby. Walk down through the beach gate to the ocean where you will find sand beach (more or less depending on the season) and tide pools directly in front. You can relax in the tide pools and fish (the pelicans do!). Good swimming and surfing can be found within a very short walking distance - about a hundred meters south down the beach. There’s other fine surfing close by - at the point at Manzanillo Bay, La Boca or Saladita - and further out. When you arrive, you will be greeted and introduced to the property by our property manager, Mariana Salas and/or Eduardo (Lalo). They will help you get settled and comfortable and check on you during and at the end of your stay. Jasmine, our housekeeper, who works days (except Sunday) will also be available to help you get acquainted and comfortable. Esteban, our gardener and maintenance man, will keep you supplied with water, show you the outdoor grill and oven and possibly be able to bring you some fresh lobsters or other seafood to cook. You can get the whole house and the apartment for a group of 10 with option for additional sleeping if required. Or, if you have a smaller group, you may be able to get the house or the apartment separately (except typically for the holidays). So come and enjoy with your family and friends. Stay for a week or a month. 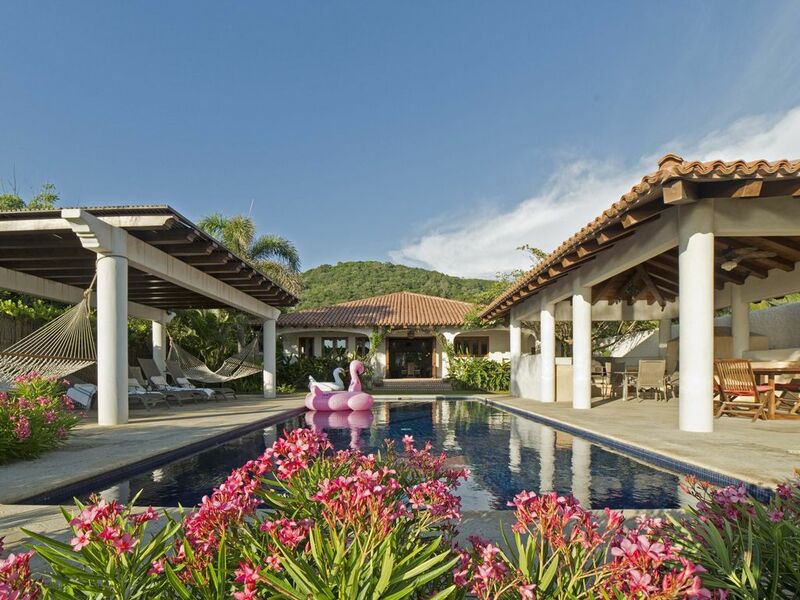 Casa Chulada is ideal for special occasions, events, weddings or family reunions. We recently hosted a benefit for the Whales of Guerrero project which was attended by more than 70 people! Or just come on your own. Relax and enjoy a quiet or active getaway near a small town on the beach in the best house on the beach. Teri and I are 'beach babies' ... Before we were born and after, our families spent time on the weekends and summers at the beach ...Teri on the west coast and Sid on the east coast. In our travels, we often found ourselves drawn to beach locations and when the opportunity came up to buy beach property we luckily were able to do so. We visited and dreamed about the land for 15 years before we decided to build. Teri's art and design background was instrumental in the plan and design of the house and with collaboration from Sid (who also is a builder and artist/designer) and from our truly amazing, energetic and skilled local builders, we were able to realize our dream of a home away from home. We chose to build Chulada from the ground up because nothing existed in this place that approached what we really wanted -- an intelligently designed place where family and friends, young and older, could come to relax and enjoy each other, enjoy the beach, watch the most amazing sunsets, catch sights of seabirds and butterflies, dolphins and whales and listen to the crickets and waves as we fall asleep. Chulada is a bare foot house....the moment you step inside, you can take your shoes off and never have to put them back on until you leave. Water is purified though we advise using bottled water for drinking and cooking. The pool is the cleanest and most chorine free we've ever experienced. The gardens are amazing with plants and palms and fruit trees all around. And we've tried to make the house as eco-friendly as we could while giving ourselves and others all the options of comfortable living. toilet, tub, shower, Master Bath has two sinks. All bathroom have marble counters and floors. Master Bathroom has a two-person non-jetted soaking tub and two sinks. Casa Chulada seats on the water edge. Linen changed every 3 days. Generally used for House Laundry only. However, laundry can be done by special request. There will be an additional charge per load (best if arranged in advance so we can arrange for additional help). Towels are changed every 3 days. Two beach bikes and two boogie boards. One 9' sofa, two oversized chairs, coffee table, and entertainment area with big screen TV. S/S refrigerator and S/S freezer. S/S Viking 6 burner with gas grill range. 2 ovens in Viking S/S range. Pizza oven in outdoor kitchen. Wood burning. Good for cooking fish and chicken too. Olive oil. salt, pepper, sugar, coffee, and tea. Large chef's kitchen with 9' marble island and breakfast bar that seats 4. Large Outdoor kitchen with BBQ and Pizza Oven and adjacent dining area. The dining room is part of the great room, which includes the kitchen and living room. The dining room table seats 12 people. Design and cooking books. Other books and magazines. Grass for the kids. Large sanded area for play or meditation. Nearby with local guide and friend, Alejandro, of Costa Nativa. Two beach cruisers and smaller one. Three patios, one garden two on ocean side. In Ixtapa, 15 minutes away by car. Excellent local Spa services including massage (in and out of house all types), mani-pedi's and facials, waxing, etc. Excellent local opportunities for Yoga, QiGong, Acupuncture, etc. Excellent local opportunities for guided adventure tours, horseback riding, Paddle boarding, bird watching, snorkeling and surfing. My family of four had an absolutely wonderful stay at Casa Chulada. The house is gorgeous, with just the right combination of personal touches and amenities. Each of the three bedrooms was comfortable and spacious, and the master opens on to the ocean and the constant sound of roaring surf. The location couldn’t be better—it’s directly on a rocky stretch of the beach, which is especially lovely at sunset, and directly adjoining an endless, deserted beach perfect for body surfing. The pool is especially lovely, surrounded by flowering plants and shaded areas for outdoor dining and relaxing. The staff was helpful and unobtrusive, and the property manager was terrific. We really couldn’t have asked for a better stay. We loved our stay at Casa Chulada. The house and the beach are a paradise. Thank you for everything! High quality luxury with plenty of room. Just feet away from breaking waves and breathtaking views, this place has it all. Magnificent kitchen and a warm friendly staff made our stay very comfortable. I have been to Tronconnes multiple times and this rates right up with the nicest places available on the beach. Highly recommended for large familys or groups of couples. Casa Chulada exceeded our expectations! We were traveling with 11 people of all ages and everyone was impressed and had a fabulous time. The home, yards and pool all gorgeous and the view was amazing. The house was completely equipped with a full kitchen, needed toiletries, nice linens, comfy beds, books and games. We toolk advantage of the chef to cook breakfast and dinner for our group which was deliscious and so relaxing not to have to worry about where to eat and no dishes! I would highly recommend Casa Chulada if you like feeling spoiled! The photos on this site do not do it justice. It is more beautiful in person. Gracias Casa Chaluda! Thank you for your glowing review of Casa Chulada. Sid and I are so very happy that you and your family had a enjoyable time. We hope to see in the future. Please let us know if we can be of service. Salute! The house is perfect for a family stay, the pool is perfect and the location is amazing, 3 minutes by car to Troncoso town but is the perfect distance to feel you are many miles away, very few (3 to 5 at the top) people in the beach. The waves are perfect, the Sandy beach is perfect all the things you need are made to have a perfect stay!!! Hola Isaac and family. Thank you for your glowing review of Casa Chulada. Sid and I are so happy that Chulada met your needs for a family vacation. If we can be of service to you in the future, please do not hesitate to let us know. The property is beautiful and perfect for big families. The service of Jasmine and Unfalia was efficient and warm. We really enjoy it! Wonderful ecotours including river hikes and meals with local family, kayaking on Boca river with bird watching, hiking on beach or in foothills, local biking. Great variety of restaurants including typical Mexican fare, super fresh fish and sea food, excellent steak and small snacks. Casa Chulada Cancellation Policy: High Season (November 1-April 30): The initial 50% deposit is non-refundable UNLESS cancellation is done within 14 days of receipt of deposit. If you cancel more than 60 days in advance the other 50%, if already paid, will be reimbursed. Low Season (May 1- October 31): The initial 50% deposit is non-refundable UNLESS cancellation is done within 14 days of receipt of deposit. If you cancel more than 45 days in advance the other 50%, if already paid, will be reimbursed.